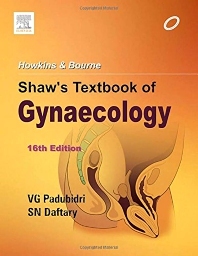 Shaw's Textbook of Gynaecology, one of the best-selling gynaecological textbooks of all time, has maintained its popularity with teachers, examiners and students. It is now in its 79th year of publication. The organization of content in this book is such that it provides the reader with a logical sequence of events that aid learning. The main objective of this best-selling title is to meet the needs of undergraduate medical students and those preparing for postgraduate medical entrance examinations. This book will also be useful for nursing and physiotherapy students.